PORTLAND, Oregon, October 28, 2016 (ENS) – In a surprise blow to federal government control over public lands, a jury has delivered a not guilty verdict for seven defendants charged in the occupation of Oregon’s Malheur National Wildlife Refuge earlier this year. Brothers Ammon and Ryan Bundy and five others were found not guilty of conspiracy following a trial that lasted for weeks in a Portland courtroom. Their five co-defendants Jeff Banta, Shawna Cox, David Fry, Kenneth Medenbach and Neil Wampler were all found not guilty. The jury could not reach a verdict on one count of theft for Ryan Bundy. Prosecutors initially charged the Bundy brothers and 24 others with conspiracy to prevent Bureau of Land Management and U.S. Fish and Wildlife employees from doing their jobs at the wildlife refuge in rural southeastern Oregon’s Harney County. The charges stem from the 41-day armed occupation of the Malheur National Wildlife Refuge near Burns. The occupation began January 2 and ended when the final four occupiers surrendered to the FBI on February 11. The Bundys testified that their plan was to take ownership of the refuge by occupying it for an unspecified period of time and then turning it over to local officials. They testified that the occupiers carried guns because they would have been arrested immediately otherwise and to protect themselves against possible government attack. The courtroom erupted in chaos after the verdicts were read Thursday afternoon when an attorney for group leader Ammon Bundy yelled at the judge demanding that his client be immediately released. U.S. marshals took attorney Marcus Mumford down, used a stun gun on him and arrested him. U.S. District Judge Anna Brown cleared the courtroom. The judge said the Bundys must remain in custody because they still face charges in Nevada stemming from an armed standoff at his father Cliven Bundy’s ranch in 2014. The case in Nevada goes to trial early next year. 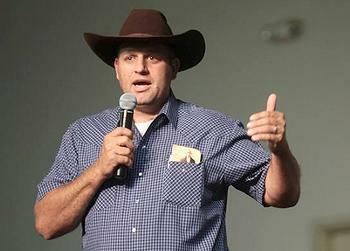 It involves allegations of a more serious threat than preventing federal employees from doing their jobs – an armed standoff with dozens of Bundy supporters pointing assault rifles and other firearms at federal Bureau of Land Management agents and contractors rounding up cattle near the Bundy ranch outside Bunkerville, Nevada. Cliven Bundy ran afoul of the law after he had grazed his cattle on public lands for years without paying grazing fees, denying the government’s right to control federal lands. After the verdict in the Oregon trial, Greg Bretzing, special agent in charge of the FBI in Oregon, told reporters how disappointed law enforcement officials are with the jury’s decision. “For many weeks, hundreds of law enforcement officers — federal, state, and local — worked around-the-clock to resolve the armed occupation at the Malheur National Wildlife Refuge peacefully,” Bretzing said. “Although we are extremely disappointed in the verdict, we respect the court and the role of the jury in the American judicial system,” he said. U.S. Attorney for the District of Oregon Billy J. Williams was less pleased with the outcome. “While we had hoped for a different outcome, we respect the verdict of the jury and thank them for their dedicated service during this long and difficult trial,” Williams said in a statement. Environmentalists as well as law enforcement officers are upset by the Malheur occupation verdict. Many environmentalists believe that allowing armed occupiers to take over public lands sets a dangerous precedent, putting wildlife at risk and disrespecting the people charged with protecting America’s natural resources. The National Wildlife Federation is calling on Congress to stiffen the penalties for illegal occupations of public lands and strengthen protections for the public servants managing them. 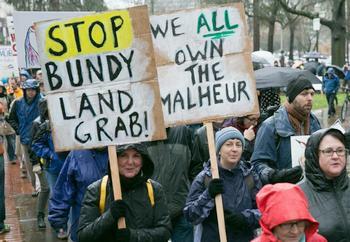 Kieran Suckling, executive director of the Center for Biological Diversity, who went to the Malheur refuge during the occupation as an observer, called the acquittals disturbing. “The Bundy clan and their followers peddle a dangerous brand of radicalism aimed at taking over lands owned by all of us. I worry this verdict only emboldens the kind of intimidation and right-wing violence that underpins their movement,” said Suckling. The American Bird Conservancy said it “respects the judicial process but is deeply troubled” by the outcome of the Malheur National Wildlife Refuge case. “The occupation of the Malheur National Wildlife Refuge was an affront to the millions of Americans who love birds and the public lands that provide them habitat, and who respect federal employees for trying to do their jobs,” said ABC President George Fenwick. The Bundys and their followers hold land-seizure views also held by some extreme western lawmakers and special interests, including the Koch brothers-funded American Lands Council, the American Legislative Exchange Council and the Coalition of Western States. Congressman Rob Bishop, a Utah Republican, held a congressional subcommittee hearing in September on what he calls the “Public Lands Initiative. H.R. 5780, authored by Bishop and fellow Utah Congressman Jason Chaffetzwhich, would seize millions of acres of federally owned land in Utah and give it to state officials for mining and oil and gas drilling by private companies. H.R. 5780 has been widely criticized in Congress and by dozens of environmental groups, tribes and members of the public.